Our board sent questionaires to candidates running for city council and we will be posting their responses here. Ray Ellis is running to replace termed out Councilmember Sherri Lightner who currently represents District 1. Ray Ellis. Image via Ellis' website. 1) How do you envision the growth of cycling in San Diego – be it for transportation, recreation, or otherwise? Cycling is a big part of the culture in San Diego. There are numerous cycling clubs and associations dedicated to promoting all aspects of the sport. All trends indicate this interest and growth will continue. Beyond the recreational aspects, cycling is part of our transportation options, quality of life, economic vitality and key to reaching our environmental objectives through the Climate Action Plan recently adopted. 2) What steps must be taken to ensure the success of San Diego’s “Vision Zero” goals? It is important to pursue the ambitious goals of the “Vision Zero” to ensure the City can effectively reduce pedestrian, bicycle and other traffic fatalities. City streets must be safe for all modes of transportation. To effectively implement “Vision Zero” I will recommend the following. 1) Focus on investing in the priority corridors with the most traffic accidents as studied by Circulate San Diego. Create a dashboard to track traffic data in these priority areas. 2) Provide an equal focus on all three components critical to an effective Vision Zero strategy: education, enforcement and engineering. The City needs to collaborate with schools, non-profits, community planning groups and other members of the community to invest in public safety messaging to ensure the broader community understands how to safely share the road and learn how to appropriately use and interact with new multi-modal infrastructure. The Department of Transportation and Storm Water needs to work closely with the San Diego Police Department to share and monitor traffic fatality and accident data to target enforcement in high-accident corridors. There needs to be continued investment in engineering improvements as identified in the bike master plan and pedestrian master plan. 3) Train staff on “Complete Street” planning and design. 4) Develop a Transportation Master Plan, which will incorporate Vision Zero components and provide transportation priorities citywide. 5) Update the City’s Street Design Manual to incorporate new Vision Zero principles in striping roadways to provide for improved bike facilities. 6) Incorporate guidelines and practices from the National Association of City Transportation Officials (NACTO) in the planning and design of projects. 3) Given the myriad of competing interests in D1 neighborhoods, how will you handle individuals and groups, alike, whose interests and actions run counter to the City’s transportation and street design goals as laid out in the Climate Action Plan, and Vision Zero initiative? The two key components are education and collaboration. I am an independent problem solver with a proven track record of volunteer, community and civic leadership. As the volunteer Board Chair for Equinox Center, I spoke out in support of the Climate Action Plan and was very pleased to see the collaborative effort during the process. As a volunteer member for the Del Mar Mesa Community Planning Board, we often see the conflict between the environmental community and mountain bike groups regarding accessibility especially within the Los Penasquitos Canyon Preserve. My centrist approach and a willingness to work with others will ensure we get positive outcomes in District 1 and the City. 4) Multiple studies have shown that increased bicycle accessibility, is good for local businesses – and that this even holds true when on-street parking is reduced. How can the information gap between advocates and businesses be bridged to advance our common interests of safe, thriving neighborhoods? Further, at which point do you say to those who refuse to engage as responsible and reasonable partners in the community’s progress, that the cycle of arguments must end so we may act for the common good? 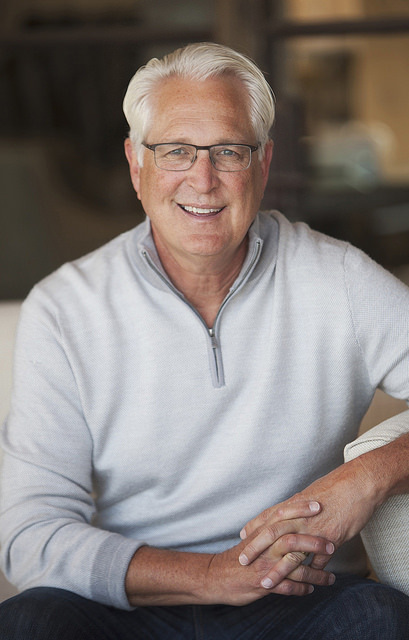 I have a successful and proven record of leading businesses, non-profit organizations and civic organizations. In those leadership roles, I have been able to get individuals and groups to focus on positive outcomes by working together. As San Diego continues to grow organically we need to be innovative and creative. We have a great opportunity to improve our neighborhoods and small businesses by creating more walkable and bikeable communities. We have successful models we can adopt in San Diego. This coupled with activating currently underutilized spaces creates vibrant communities. While volunteering at the Balboa Park Conservancy, we did this for the Plaza de Panama space in collaboration with the City, Southwest Airlines and Project for Public Spaces. I am a big believer that we can do more of these public-private partnerships throughout the City. I have been endorsed by every business organization that has done an endorsement. I am supported by countless non-profit leaders who I have worked with over the last 2-decades. I want to use this experience to bridge the gaps you are referencing. 5) What (if any) plans and decisions, with respect to increasing cycling accessibility, have been made in the past by government agencies and elected officials that you disagree with? Did you make public that disagreement? And do you see an opportunity, if elected, to reverse it? My primary focus over the last decade has been volunteering in leadership roles with non-profits addressing many of the unmet needs of members of our community. I am interested in learning more about cycling policies that are working and those that need to improved. 6) Will you support the implementation of the 2011 San Diego Bicycle Master Plan Update, including budgetary requirements for its completion and success? I agree with the Bike Advisory Committee’s strategy to create and implement a plan that prioritizes projects in Vision Zero communities as well as historically underserved communities as defined by the Cal Enviro Screen. As outlined, there are six high priority projects that meet both these criteria. I am committed to ensuring the implementation of these six priority projects during my term. I also support efforts to implement the Downtown Mobility Plan. 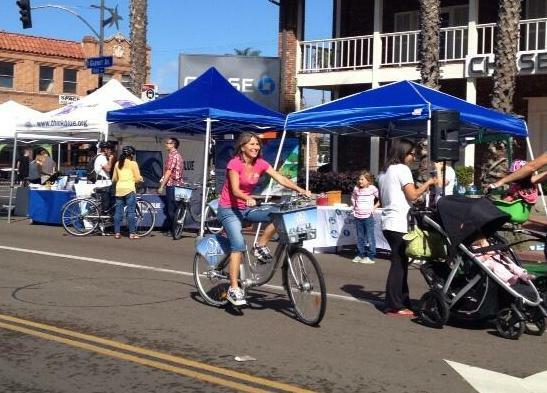 7) If you have one, share a favorite cycling memory – and let us know how it shapes your desire to see safe streets in San Diego for all residents, across generations? When my fourteen year-old was about three, we were living in the Pacific Beach area. Jake and I would spend hours almost daily riding throughout the beach area, stopping at parks like the one in south Mission and then a snack on the way home. I was consulting and volunteering at the time and fortunately had the time for this morning ritual. 8) Finally – If elected, will you commit to meeting with BikeSD representatives on a regular basis to continue the dialog around improving all D1 neighborhoods, and making San Diego the world’s greatest city for cycling? Yes, of course. 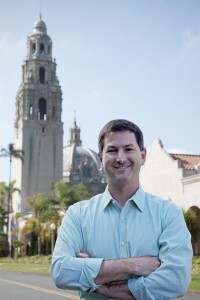 I value all points of view on issues and am interested in BikeSD’s perspective and expertise. We have many great opportunities to protect and improve the quality of life in San Diego. This is not only true in District 1, but throughout the City. Thank you for the opportunity to respond to your Questionnaire. I hope to have the opportunity to meet in person to discuss these and other issues. Please contact me with any questions or thoughts. Our board sent questionaires to candidates running for city council and we will be posting their responses here. 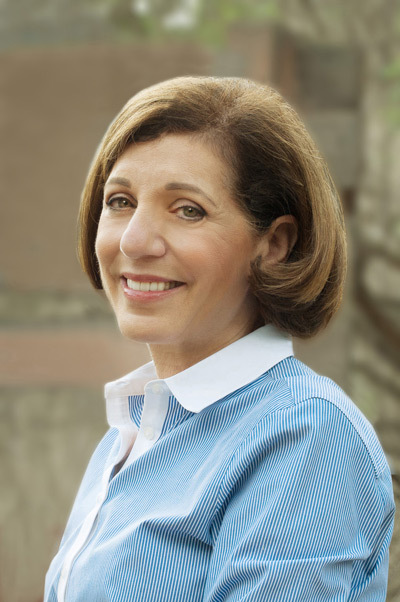 Barbara Bry is running to replace termed out Councilmember Sherri Lightner who currently represents District 1. Barbara Bry. Image via Bry's website. The City’s recent adoption of the Climate Action Plan mandates expanding mobility options from single-occupant cars to transit, walking and biking. We cannot meet the CAP’s mobility goals without making cycling an easy and safe mode of transportation whether it is for commuting, running errands, or recreation. We have agreed on the targets for 2020 and 2035 and we must work together to meet those targets. Do you see cycling as a community builder? Yes! A community is not just a collection of buildings but the people who live, work and play there. Active transportation, including biking, provides that human interaction that is such an important element in building community. Too often San Diego makes grand announcements or adopts new policies that whither because there is no authentic follow-up and implementation. We can begin to meet those goals by focusing infrastructure dollars on our City’s most dangerous intersections. We have to prioritize San Diegans having safe routes to walk/bike to neighborhood stores, libraries, and parks as well as commute to work. While San Diego is still in era of limited revenue and a staggering infrastructure deficit, public health, safety and mobility must be prioritized. It is important that we continue to do outreach to all stakeholders in each community. The City has failed to do so in adopting the CAP, Vision Zero, and other master plans and policies. Worse, upon adoption, elected officials fail to be on the frontline to explain how those decisions will bring positive changes to our neighborhoods and prepare stakeholders before they are confronted by a specific project. The City must take the time to hear from everyone to properly vet implementation, and we must be flexible to hear their concerns, bend where possible, while moving forward. My staff and I will be a pro-active leader in those conversations. I agree with the premise of your question. Further, I am heartened by changes in Sacramento that takes CEQA out of the approval and implementation of increasing bicycle accessibility. Again, it comes down to leadership. Leadership to have robust stakeholder input, listening to concerns, vetting every option, bending where possible, but we must move forward for the common good. In turn, I will need your help to balance the conversation; to elect pro-bicycle members to planning groups, BIDs, and CDCs; and, to identify ways to mitigate legitimate concerns. * continuing failure of City to implement cycling tracks (separate and protected bike lanes) and the city’s reliance on sharrows. Yes. The city must honor the adopted master plan. We are still operating in an era of limited revenue and a staggering infrastructure deficit; nevertheless, in a prudent fashion, we must implement the master plan. I am not the most athletic person, and I do not ride a bicycle regularly. One of my early cycling memories is learning to ride a bike in my neighborhood outside of Philadelphia where I grew up. I was very proud of my pink Schwinn with its straw basket. One of my most memorable rides was doing the 17-mile drive in Pebble Beach. Yes. One of my staff will be a point person for active transportation and will monitor the Bicycle Advisory Committee. I will meet on a regular basis with advocates for active transportation. Our board sent questionaires to candidates running for city council and we will be posting their responses here. Christopher Ward is running against Anthony Bernal to replace Councilmember Todd Gloria who currently represents District 3. Chris Ward. Image via Ward's website. 1) How do you envision the growth of cycling in San Diego – be it for transportation, recreation, or otherwise? Do you see cycling as a community builder? Investing in our active transportation network will result in the growth of cycling in San Diego for transportation, recreation, and result in community enhancements and small business success. We see in cities around the world that when pedestrian and bike improvements are made we see more activity on our main streets, businesses thrive, and neighbors interact with one another. There’s been fewer community building successes than recent CicloSDias events that brought out so many neighbors to enjoy their community in a new way. installations and other projects funded outside of the CIP system. 3) Given the myriad of competing interests in D3 neighborhoods, how will you handle individuals and groups, alike, whose interests and actions run counter to the City’s transportation and street design goals as laid out in the Climate Action Plan, and Vision Zero initiative? I believe that the next City Councilmember from District 3 can provide leadership to bring stakeholders from initially disparate standpoints together and find solutions that result in safer and complete streets throughout our neighborhoods. My staff and I will spend the time it takes to explain to business owners and others nervous of change how safer street infrastructure will benefit their businesses and neighborhoods. I will also leverage the relationships I have with supportive business owners to help them speak with credibility to their peers. I believe much of the frustration around the planning and outreach for bike and pedestrian projects has come from long delays, and outreach missteps from SANDAG. My background in urban planning gives me the technical expertise and understanding to look at the data and understand all of the impacts for proposals being sold to the community. In terms of the Climate Action Plan, I will advocate for funding projects that implement the goals of the plan and many of those will be focused on bike and pedestrian improvements to allow D3 residents to use non-car modes to get around. When you look at the data from other cities that have invested in bike networks it is clear they are successful at bringing new riders into the system and increasing business for small businesses on main streets. From Portland to Washington DC, people are getting out of their car, experiencing their neighborhoods, and supporting local business. These experiences need to be shared so the information gap does not result in rejection of projects that are great neighborhood investments. As a policy and planning wonk, I know the success stories and can help facilitate those conversations. Public participation for planning transportation is essential. However, our processes would be improved if entities like SANDAG acted quickly and efficiently, with specific public timelines for reaching decisions. I will push that for transportation planning, and remind City and SANDAG staff not to repeat past mistakes. I spoke at SANDAG in favor of the Transform Hillcrest plan – an example of the business community, advocates, and neighbors coming together to support a plan that would increase cycling accessibility, increase parking, and provide great public spaces. It was a lost opportunity to not move forward with that plan and we see now that even the parking losses that were initially reported were greatly decreased due to work by SANDAG and city staff. 6) Will you support the implementation of the Downtown Mobility Plan designed by CivicSD, including budgetary requirements for its completion and success? Less of a memory and more about a hope – to be able to ride bikes around the neighborhood with my daughter Betty when she gets older. I am lucky to live in a safe pocket of University Heights with minimal car traffic but would not feel comfortable riding from our home to Balboa Park with her based on the current bike infrastructure. Prior to her joining our lives, I remember trying to bicycle to church one day along University Avenue between Vermont and 1st Avenue. We wouldn’t bring her along the same route today given our experience. 8) Finally – If elected, will you commit to meeting with BikeSD representatives on a regular basis to continue the dialog around improving all D3 neighborhoods, and making San Diego the world’s greatest city for cycling? Yes and I will have a staff member in my office who will be a liaison to the cycling community. For San Diego to compete in the global economy and provide the safety and quality of life that San Diegans deserve, our leaders must embrace a 21st Century vision for our streets that puts well-being of people first. BikeSD supports candidates for public office who will champion safe, complete and livable streets. As our new mayor was the councilmember for District 2, this council seat is now vacant (and temporarily occupied by Ed Harris). Four candidates are running for the District 2 council seat: Sarah Boot, Jim Morrison, Mark Schwartz, and current Councilmember in District 6, Lorie Zapf (now residing in the newly re-districted District 2). Below is the responses received from Lorie Zapf in response to the BikeSD questionnaire. Do you ride a bicycle in San Diego for any purpose? One of my favorite things to do in my free time is to ride bikes with my family. Since my daughters are still fairly young, we mostly ride along Class I bike paths or trails, usually around Mission Bay or along the San Diego River. During my first term on the City Council, I have been pushing for better, safer access for bicyclists, whether they ride on City streets or on designated bike paths. I am proud of my work with the San Diego River Conservancy and the San Diego River Park foundation to create one contiguous bike and walking path from the mountains in East County all the way out to the beach. Later this month I will be participating in the ribbon-cutting for the San Diego River Multi-Use Pathway Project, along with Mayor Faulconer and Councilmember Sherman. Please share your impressions and experiences of bicycling in San Diego. San Diego’s awareness and focus on bicycle safety has come a long way during my first term, but there is still a lot of work to be done. During the past three years the City has implemented sharrows, green lanes, bike corrals, CicloSDias, and we’re well on our way to having an amazing bike share program. We have some great Class I bike paths that give riders a sense of being one with nature and allow them to enjoy the outdoors and beautiful weather we have here. On the other hand, I have also ridden on our City streets and seen how some of our Class II bike lanes come to a sudden end with no connection. This is why I put forward a Resolution to Prioritize Bicycle Infrastructure Improvements to Enhance Public Safety. My resolution was unanimously approved by the City Council, but the portion my office drafted about improving bike infrastructure near freeway on and off ramps was removed. While the resolution did achieve some of my intended goals including prioritizing projects that enhance connectivity and improve ridership, directing city staff to plan and develop bicycle-friendly projects, and establishing staff positions for bicycle projects, I was disappointed that the City Council missed an opportunity to send a strong message to Caltrans about the importance of fixing where freeways connect to surface streets. What will it take for you to ride to work at least once a week to work at City Hall? What are the bottlenecks that you foresee you can help eliminate to make it safe for you to ride to work? Sometimes for events that are out in the district close to my home, I am able to bike there and I really enjoy it. In my younger days when I lived in Lake Tahoe and Huntington Beach, I commuted to work by bike regularly. I wish that this was still something I could commit to doing, but unfortunately my commute would take more than one hour each way by bike, and that is not feasible with my schedule. This is a great reason why I’m such an avid supporter of the upcoming Mid-Coast Corridor Trolley extension, and why I’m pushing so hard for SANDAG to include bike lockers and safe access for bicyclists to navigate their way to and from the new stations. The planned Morena station is a quick 10-minute ride from my house, and this would make it easy to bike to the trolley and take the trolley to City Hall. The City has not established a goal to increase the percentage of trips made by bicycle in the city’s newly adopted Bicycle Master Plan. What will you do when elected to establish that goal within the plan’s implementation strategy? When I’m out talking to the community about bikes, the most common reason I am given for why people choose not to commute by bike is safety. It isn’t enough to have a Bicycle Master Plan and double our bicycle infrastructure if the public doesn’t feel safe out on the streets. I’ve worked in District 6 to make conditions safer for bicyclists, and I will continue to do that for District 2. As the Chair of the Committee on Smart Growth and Land Use, I’ve been working tirelessly to ensure that the City is on track with implementing our Bicycle Master Plan, and have requested that Streets Division update the my committee on their efforts. I also invited the San Diego County Bicycle Coalition to give their input so we can work together on best practices and common-sense implementation, so that the improvements that we make are really the best investments for cyclists. In addition, education about bikes will be a huge component of increasing trips made by bicycle. I was pleased to allocate money from my office budget to help events like CicloSDias, which is a fantastic way to promote biking and raise awareness. I want to see events like this in every neighborhood in the City. I have also been working with SANDAG to ensure the Mid-Coast trolley stops have pedestrian and bicycle access to locations such as Mission Bay and Mission Beach. When DecoBike finally arrives in San Diego this summer, I anticipate that we will see substantial increases in bicycle trips made in the service area. I have strongly supported establishing a bike share program because it will not only raise awareness, but help close the “last mile” problem for people who use public transportation. During my first term I have worked with bike advocacy groups to bring attention to bicycling and bike infrastructure. I firmly believe that, by continuing to make progress on the initiatives we have been working on, and by bringing in new ideas, we can market and advertise bicycling as a viable transportation option to locals, and substantially increase the number of trips made by bicycle in San Diego. Do you support a wide, continuous, physically separated green bikeway the full length of Nimitz Boulevard? I support a separated bikeway along Nimitz Boulevard. It is not only an important route for daily commuters, but also has great potential for visitors and tourists by connecting our beach communities to our Port, Harbor Drive, and Downtown. Ideally, that street is a perfect candidate for study and improvements by The Green Lane Project, which was one of the reasons why I submitted a letter of support for our application. While San Diego was not selected this year, as the District 2 Councilmember, I will fight to establish a safe bike path that would connect a number of our beaches, schools, and parks. Our biggest obstacle, like so many other City projects, is identifying funding. In my current Council District, my office was able to identify funds from the Balboa Avenue Revitalization Project to address some bicycle safety issues along Balboa Avenue. I made that request a few years ago, and staff has begun working on adding green lanes and ground sensors so bikes can trigger streetlights and cyclists don’t have to run red lights. I am already aware that SANDAG has prioritized safer bike access on Nimitz through the Early Action Program, but I believe it can be possible to move up this project on the priority list by having the City provide the funding for the design and the environmental impact reports. As a current Councilmember, I already have the knowledge and experience to find funds for bicycle improvements on Nimitz, as well as throughout the rest of the district, which will be a priority for my next term. Implementing Protected Bike Lanes (cycletracks) on Nimitz Boulevard has been on our priority list since 2012. The city has been promising to put in green bike lanes (without any protected facilities) in conjunction with the resurfacing effort which has been delayed at least four times. What will you do to ensure this doesn’t happen any more in District 2? First and foremost, I have fought to make sure our city is fiscally responsible, and during my 3 ½ years on the council, we have been able to continually improve the City's finances. This makes it possible for us to go back to providing our core services, including street paving, which directly impacts our ability to implement bike infrastructure. By continuing to find savings in the city, we can focus on making sure our streets get paved, and that they get paved on time with an awareness to cycle tracks and bike safety in mind. I have seen firsthand some of the possible areas of short-term improvements on Nimitz, with the permanent goal being Class I bike paths along the entirety of the road. Just along Nimitz, I am most interested in the connecting ramps to Famosa Blvd, and the ramp farther down connecting West Point Loma Blvd. I will ask Traffic Division for an analysis, with the intention of implementing green lanes at those particular sections, and making the ramp to West Point Loma bike-only, so that cars would make a right turn at the lighted intersection. Chatsworth and Nimitz is another intersection that could benefit from short-term improvements, especially for our youth commuting to and from Dana Middle School. Lastly, I believe that most of the lanes along Nimitz are wide enough and could be narrowed through lane restriping, which would provide enough room for buffered bike lanes. As we continue to increase funding for road repairs I will be more than happy to work with our Multi-Modal Section in our Traffic Engineering Department to ensure the community’s input is heard make progress on Nimitz. I have always fought for the streets in my district and I will continue to do so. One of the San Diego’s biggest challenges to safer bicycling is the freeway merges that are under the purview of Caltrans. What will you do in your term as councilmember to ensure the redesign and construction of at least one freeway ramp for the safety of all road users, including drivers? Freeway interchanges are big expensive projects that ideally should have initially been built with bicyclists and pedestrians in mind. During my current term, the City Council authorized the design of a new freeway interchange off the 163. I was the only City Councilmember to ask the engineering firm to consider the needs of bicyclists and pedestrians when they create the designs for this new interchange. Starting this year, San Diego has an incredible asset when it comes to dealing with state departments and agencies. District 2’s own State Assemblymember Toni Atkins will be sworn in as the Speaker of the Assembly on May 12th. I am planning on scheduling a meeting with Speaker Atkins to discuss Caltrans issues following her new role. I have a history of working with our state representatives on both sides of the aisle to improve road safety in San Diego. In 2012, I partnered with then-Assemblymember Nathan Fletcher and Senator Marty Block to reform the San Diego Service Authority for Freeway Emergencies (SAFE). Our legislation freed up more than $12 million dollars for public safety and motorist aid. I am confident that I will be able to work with Speaker Atkins to make progress in dealing with Caltrans. I understand that changes to freeway interchanges are complicated and expensive undertakings, but they are a necessity, particularly when we’re talking about the safety of those who use our streets. We shouldn’t be asking bicyclists and pedestrians to risk their lives crossing these freeway merges, and I look forward to partnering with the Assembly Speaker to bring this issue to the top of Caltrans’ priority list. If you could wave a magic wand, what does your vision of a more bicycle friendly San Diego look like? I would like for San Diego not only be creative in pioneering infrastructure that works well for our unique neighborhoods, but also to adopt the best practices implemented in other bicycle-friendly cities. I would like to see more barrier-protected bike lanes on our streets, even if it is something as simple as a curb-barrier, or having a bike lane in between a sidewalk and a line of cars that are parallel parked. While we are never going to get rid of the high-speed surface streets like Balboa Avenue, we should be looking at median bike lanes like Washington D.C has implemented along Pennsylvania Avenue. New housing developments and infill development should include bike infrastructure and access, as should all growth in public transportation. I want BIDs, public buildings, and office buildings to have bike racks and bike corrals, so bicyclists have somewhere safe to lock up their bikes when working, shopping or eating. I also want to work with Mayor Faulconer to stop the practice by Purchasing and Contracting of leaving out the bike lanes and gutters when streets are resurfaced. When we pay to resurface a street, it should be for the benefit of all users, regardless of their mode of transportation. San Diego is the perfect candidate to be a world-class bicycling City. I believe we have a Mayor that shares that vision, and I know he and I will work well together for the benefit of the residents and tourists in District 2. Below is a map of District 2. If you live in the shaded area, you should be paying attention and getting ready to vote. To learn more about Councilmember Lorie Zapf, visit the campaign website or follow her on twitter. The BikeSD endorsement policy is available here.